A small private garden lined with a few tall trees, several shrubs of varying heights – some in pots, some planted in the ground, and several flower-laden creepers going up on all the garden walls. A few chattais (handwoven straw-mats) are rolled out on the grass, topped by some colourful cushions and low stools. A monotone wind-chime from the back garden adds a lovely musical feel to the whole setting every few minutes. Every passing breeze brings with it the mild fragrance of Madhumalti flowers blossoming nearby. A small group of 8 youngsters, of ages between 18 and 25 can be seen in the garden. Some are relaxing on the chattais or on stools, a few are standing or walking around. One can hear soft sounds of talking, laughing and friendly chatter. The group mentor, Mridula Di enters the scene. Smiles warmly toward the group and sits on a low stool. Within a couple of minutes the group gathers around and arranges itself in a semi-circle facing the mentor. M: Good evening. And welcome to this study camp. How is everyone today? Some collective voices: Good evening. Binoy: We are all good, Di. How are you? M: I am doing well. Thank you! Before going further, let’s have a few minutes of quiet concentration. Let’s just close our eyes and sit in this lovely silence that is all around us, try to find a place of silence within. Is that okay? M (Smilingly looks around toward the group): Welcome again! It is a beautiful evening today, isn’t it? I am so happy we decided to have our study camp out in the open, instead of our regular classroom. I hope you all will be comfortable here. Colin: Oh, I think it is lovely out here. And I am so glad you thought of doing this out here. I think most of us feel that way, no? Dia: O yes, indeed. No doubt about that. M: Well, there is some water in that corner there on the veranda, if anyone needs it. Feel free, anytime. By the way, as we go along we may shift indoors at different times, if we need to watch some film or do some other work that requires us being inside. So we shall keep it flexible, is that alright? M: I assume we all know each other from our previous study camps, right? Nobody is a stranger to this group, is there? Dia: Nope, I think we all have known each other for a while now! M: Good. That’s very good. So let’s get started right away, shall we? Avi: Yes. I am curious as to what we are going to do in this study camp? It is titled: “India and Me”. What do you really mean by this title, if I may ask that right away? M: Yes, please feel free to ask any questions. That’s what I would prefer, in fact. A more informal discussion form of learning instead of only me lecturing! 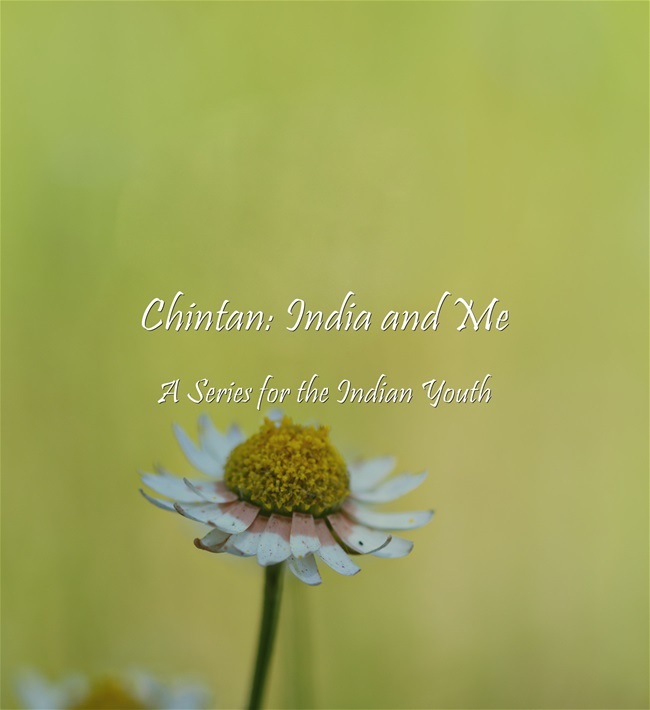 But of course, as you must have read in the program brochure sent to you earlier, we will be exploring this theme of “India and Me” in the light of Sri Aurobindo’s writings. So from time to time I will be reading out and giving you copies of selected passages from Sri Aurobindo’s or the Mother’s writings that will help us explore some of the points or topics that we come across. We will be discussing those passages quite thoroughly as required. I will provide necessary explanations, and I will encourage you to ask as many questions as you can think of. That way we will all learn deeply and it will be an enriching experience for all. Is that okay? Avi: Sounds good to me! M: Well then, let’s get started! The first question we have here is – what is the meaning or intent behind the title – “India and Me”? I guess one way to address this question would be by posing a related question – why did I pick this title? To answer this I would like to share with you an important thing Sri Aurobindo has said about the three main aims of good education. “…the only true education will be that which will be an instrument for this real working of the spirit in the mind and body of the individual and the nation. That is the principle on which we must build, that the central motive and the guiding ideal…. …It must be an education that for the individual will make its one central object the growth of the soul and its powers and possibilities,…. ….for the nation will keep ﬁrst in view the preservation, strengthening and enrichment of the nation-soul and its dharma…. ….and raise both into powers of the life and ascending mind and soul of humanity. Colin: Wow! That sounds heavy! Eesh: Yes, it definitely does! M: Sure it does sound heavy. It is Sri Aurobindo, after all! M: And in a way that’s what we will try to do in this study camp. We will take up some of these profound, or what you call as ‘heavy’ ideas and see if we can grasp their essence by understanding them slowly and carefully. That’s how we will grow in our intellectual capability too. Shall we try with this particular passage that I just read out and see what we can make out from it, especially as it applies to what we are trying to do here? Shall we give it a try? M: So let’s see. Here Sri Aurobindo is speaking of the central aims of a good education. He tells us about three such aims, and also a fourth one which he says is the final or highest object of a human being’s life, and therefore, of the education too. But let’s keep aside that highest object for a few minutes and focus on what he presents as the three central aims of a good education. Alright? Avi: Sure. But the highest aim was that awakening and development of the spirit….right? M: Yes. Exactly. But if we go straight to that highest goal, we may ignore the other important ones before that! M: But I am actually serious here. As per the Indian thought, while spiritual development is indeed the highest purpose or objective of a human being’s life, there are also many other important pursuits that human beings must undertake in order to experience a full and holistic life, as well as grow and develop in a holistic way. Binoy: Hmmm….this sounds like another interesting line of questioning. M: Yes, very much so. And perhaps we should consider taking it up at some point. Because I think it definitely pertains to the “me” part of the course title – India and me. Dia: Now you are making me more curious! M: Good, that’s a good thing then! Let’s keep this curious and inquisitive attitude as we proceed. I will make a note of this line of thought, about the different pursuits in life, in my notebook here, so we can come back to it at a later time. (She writes down a note in her diary). And finally, to raise both the individual and nation into powers of the life and ascending mind and soul of humanity. Are you with me on this, so far? A few other voices: Not so sure. M: Hang on there! Let us take it a bit slowly. M: Now we will, for the time being at least, ignore point no. 1 and go straight to no. 2, which is of most direct relevance to us at the moment. When we read it again, we find that Sri Aurobindo here does assign a very specific role to education for the purpose of nation-building. But it is not the nation-building in the sense we typically understand it to mean – that of making good citizens, good workers for the society etc. No. He speaks of something much deeper. Isn’t that so? Dia: Well, but those other goals of nation-building are necessary too, aren’t they? A nation does need good citizens, good workers etc. M: Of course, they are important goals, worthy in themselves. But they are not or should not be the end-all of good education. In fact, they may be the natural outcome of the deeper goals that Sri Aurobindo speaks of here. That of preserving, strengthening and enrichment of the nation-soul and its Dharma. We should be spending some time exploring this deeper connection each one of us has with the nation we are living in, the nation we are a part of. That should gradually also help us understand the significance of the word ‘and’ in the title: India and Me. Does that make sense? Let me stop here and see if any of you have any comments or questions at this point? Is this all making sense so far? Gul: Yes it does, in a way. Though I am sure I will understand it more as we go along. I also think that the broad nature of this theme “India and Me” can allow us to explore many possible inter-related questions as we go further. M: Exactly. We would definitely come across many inter-related questions, or subtopics as we proceed in our discussions. Anyone else would like to say something? Hari: Well, I am even more curious now as to what all we will be discussing. M: But that’s the thing, you see. I would like us to keep this spirit of healthy curiosity and inquiry throughout this experience. We are not here to follow a set curriculum of these many chapters with these many assignments etc. We are here to discover a few deeper truths about our motherland, the nation to which we belong, and possibly a few truths about that which makes us Indian. Or what we may call as Indian-ness. What do you say? Dia: Sounds good! I am game! Eesh: Di, I have a question. Eesh: About the aim # 2 that you just read out…by the way, will you be giving us copies of this particular passage? I like it very much. M: Yes, I have copies of it right here, for all of you. Will give you at the end of our session. Eesh: There are some big terms there – nation-soul, nation’s dharma. I guess it is important to know what is meant by those terms. 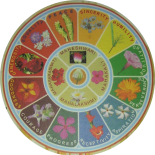 I suppose if we try we can make some broad or general guesses about these, at least we have heard these terms – dharma, soul etc. But what really is a nation-soul? And what can possibly be national dharma? Avi: Yes if we don’t really understand what is national dharma, how can we work toward preserving or strengthening it? M: Great questions. This is exactly I would like our sessions to be like. Exploratory, open-inquiry, involving such probing questions. Now, what do we mean by nation-soul and what is national dharma? I am sure you can guess these are not simple questions. So their answers will not be simple either. But we can try and understand to the best of our ability. However, before we take up these ideas of nation-soul and national dharma, we will need to take up the terms ‘nation’, ‘soul’ as well as ‘dharma’. Makes sense? Eesh: Yes it does. So what is really a nation? M: Yes, that’s a great place to start. Let me just quickly add that you realise we also skipped the aim number 1 in the passage we read earlier. Right? Maybe we will come back to it later. And perhaps also to the aim #3, the one that concerns the humanity at large. But let’s just proceed with the question that has come up now. Anyone wants to begin? What is a nation? The world would be a better place if we had more such teachers and students.Read your interesting article once but will read it again, liked the spirit of healthy curiosity and inquiry mentioned here. This was an insightful conversation. I wish we all could be taught in this manner. This sounds so surreal. Yet, I wish it were an everyday reality. Curricula such as this, teachers such as this, are no longer a part of the education ‘system’ of India. And that is the saddest truth. Loved this… now for the next one! I join you in that wish and hope that someday our future generations will experience a better, a more humane and free learning approach in their schools. Until then, let’s dream up of such classrooms 🙂 So happy you enjoyed this. I so felt a part of this conversation…i was smiling as some questions I had in mind were asked by some of these youngsters and they got answered too.. This entry was posted on July 13, 2015 by Beloo Mehra in Education, India and tagged Indian Renaissance.